2) Click Continue and confirm the order. 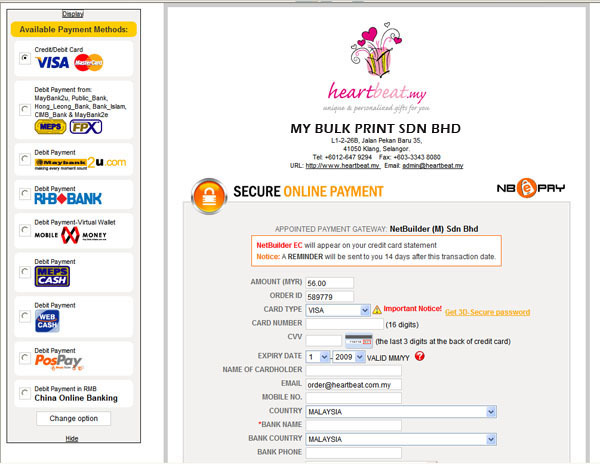 3) You will see the Online Payment screen as below. 4) Follow the given instruction to complete the payment. 5) After complete the payment, we will receive a notification from the online payment service and verify it. 6) If the payment is cleared, we will deliver the items to your shippping address. We will email you the draft in 24hrs or proceed to delivery once the payment has cleared. Oops. I don't know how to pay online through Internet Banking. Here are the ways.